In Carriage Horse Fight, Who’s Most Contemptible? Back in their city stables, they can barely lie down, and when they're no longer able to work, they're sent to auctions in Pennsylvania where they can be, and are, sold to business people who transport them to Mexico or Canada to be slaughtered and exported as meat. Which of this unsavory trio should get the prize for being the most contemptible? Or is it Jimmy Fallon, for being more concerned with sucking up to actors than with protecting abused animals? Or do we give the prize to the audience for cheering at whatever the actor says and the host agrees with? I'd say the audience wins. Judging from their behavior, you'd have to believe that if Neeson were lobbying for child abuse, Jimmy Fallon would agree with him, and the audience would just keep cheering. Fallon comes in second for being such a toady. And while Neeson is clearly contemptible, it's the audience that has the power to stop this by giving him the silent treatment or, indeed, by booing him and Fallon off the stage. To confirm this, check out what happens when Neeson goes up against a host who's not as brain-dead as Fallon. Here he is on The Daily Show with Jon Stewart, who, while remaining friendly, makes it crystal clear that he doesn't buy Neeson's shameful nonsense about the carriage horse trade. There's no cheering this time: the audience goes with Stewart. The response of Stewart and the audience clearly throws Neeson off balance. So, what does he do? Like an angry child, he challenges Stewart to a fist fight! Sure, it's play-acting, but it's quite revealing about a man who's either too high on testosterone ... or perhaps too low. the owner/driver who was arrested for forcing his horse to keep trotting around Central Park with an injured leg. 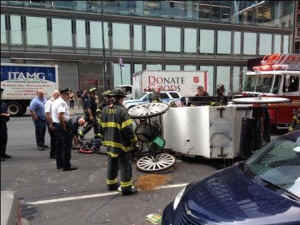 the horse who got spooked in traffic and knocked over the carriage next to him. That's a great life, Liam. Maybe you should "man up" yourself and take their place on the streets. You, too, Jimmy. And bring your audience, too, to cheer you along.